The crew of the GCS Dunsparce traveled to the Federation world of Otho to gather some supplies and better equip their ship in preparation for their journey into the uncharted sector. Arlon, Morgan, and Dmitri found H’s makeshift lab in the med bay sealed tight with strange noises emanating from within. They were unable to get inside and find out what was going on so they were forced to conduct their business on their own. Once the Dunsparce was equipped with a weapons system, the crew set a course for Manitou in the Outer Rim to meet with one of Arlon’s old contacts to get their ship equipped with some weapons. The Dunsparce drops out of warp space in the Hadrian System in Outer Rim Sector 31. Arlon brings the ship into orbit around Manitou, a large blue gas giant orbited six moons and many asteroids. There are some mining facilities and colonies and such floating in Manitou’s atmosphere as well as those scattered across its moons. Arlon flies the ship towards the fifth moon, a terrestrial rock with no atmosphere to speak of. The moon is barren on the surface but deep down it is rich with ores. There is a rather large mining colony on the surface out of which many organizations, both legal and illegal, operate, including Arlon’s old acquaintance Maxx Aler. “So who is this Maxx guy, exactly?” Morgan asks as Arlon sets the ship down in one of the colony’s hangars. With H and Shane still locked away in the lab, Arlon, Morgan, and Dmitri disembark from the Dunsparce to meet with Maxx on their own. Upon arriving at Maxx’s shop, they find him scanning through his datapad not really paying attention. Arlon clears his throat, causing Maxx to look up. “Arlon Jett? Is that you?” he asks. “In the flesh,” Arlon replies. “Well, uh... I’ve been ‘dead,’” Arlon says jokingly. “Oh, ask him about the warp stuff,” Dmitri chimes in. “Let’s worry about the weapons first,” Arlon tells him. “What about missiles?” Dmitri asks. “What’ll it be then?” Maxx asks. “We’ll take a photon laser and an ion laser,” Aron tells him. “That’ll be three-thousand credits,” Maxx informs the crew. “I don’t suppose you could give a discount to an old friend?” Arlon asks. “Wait, you knew who those pirates were and you didn’t tell us?” Morgan cuts in, sounding quite annoyed with Arlon. “Sorry, luv, I didn’t think it was important at the time,” Arlon tells her, not expecting to have been overheard. Arlon turns to leave, but Dmitri hangs back and approaches Maxx. “Do you know if there’s some sort of black market for selling Pokemon?” he asks. “Then stay here,” Dmitri replies. “Alright then, I’ll just go keep an eye on Dmitri,” Arlon tells her. He steps off the ship, then stealthily trails behind Dmitri. He follows him to the location Maxx directed him to and spots a group of shady looking individuals. “I’m looking to sell some Pokemon,” Dmitri announces as he approaches the group. “They’re decent,” Dmitri tells him. “He says they’re decent boys,” the leader says with a slight laugh. “Let’s see if he’s tellin’ the truth.” He pulls out a Pokeball and sends out a Crawdaunt. In response, Dmitri sends out Shellos. “Use Mud Bomb,” Dmitri commands the Pokemon. It spits a large clump of mud at the Crawdaunt, though it doesn’t seem to do very much. “Crawdaunt, use Vice Grip,” the gang leader commands his Pokemon. It moves in on the Shellos and clamps one of its large claws around the Pokemon, delivering a pretty nasty blow. “Use Mud Bomb again!” Dmitri commands his Shellos. The Pokemon backs up and spits another blast of mud at the Crawdaunt, this time much larger than the previous one. This time the Pokemon seems to take a significant hit. “Now, Crabhammer!” The Crawdaunt moves in once again and smashes one of its claws down on the Shellos, knocking it out. Dmitri sends out his Solosis to replace it. The gang leader just laughs. “Night Slash,” he commands. The Crawdaunt swipes at the Solosis and delivers a nasty blow, taking it down instantly. Dmitri immediately sends out his last Pokemon, the Numel he caught on Silicron. “I thought you said they were decent,” the gang leader taunts. “Crawdaunt, use Crabhammer again.” The Pokemon moves in on the Numel and slams its claw down once more. However, the Numel managed to narrowly avoid getting hit. “Use Magnitude,” Dmitri commands the Numel. It unleashes a quake that delivers another significant blow to the Crawdaunt. “Use Harden,” the leader commands in response. The Crawdaunt hunkers down and hardens up its armor. “Use Lava Plume!” Dmitri commands the Numel. The Pokemon unleashes a blast of lava at the Crawdaunt and takes it down. “Alright,” Dmitri agrees. He places the Pokeballs down on the ground, then takes his credits and leaves. Morgan meets up with Arlon and Dmitri at Maxx’s shop and they head inside to finish their deal. “I believe we have some information you might be interested in,” Morgan tells Maxx as they enter..
“Go on,” Maxx tells her. “We made a delivery to a Romanov research station and we stole some data on what they working on,” Morgan explains. She transfers the data on Project Genesect from her Pokedex to his Datapad. “So, about your end of the bargain,” Arlon says, snapping Maxx back to the deal at hand. “Thanks for the tip, mate,” Arlon tells him. Session/Revision Notes: This part of the session was interesting. After we spent the first half on the planet Otho we met with one of the contacts I came up with for Arlon in order to advance the plot. I kind of derped and didn’t bring up Arlon’s past very sneakily and made him seem kind of like an idiot, but it was good to get that information out of the way and start moving Arlon’s character forward. I actually developed Arlon’s backstory a lot more since the original chapter was posted, so in going back to the rewrite I was able to describe Arlon’s past a lot better. That’s one of the cool things about coming back to the old chapters all this time later. A funny thing happened at the end of the session. DragonStorm used his random planet generator to come up with the planet the Red Suns are on and it turned out to be a level 3 civilization desert planet in the Outer Rim near Alliance space, which is exactly like the planet Banton I came up with for one of the other contact locations. DragonStorm just rolled with it and decided that the planets were one and the same. MAJOR SPOILER WARNING IN THE COMMENTS! Post-Chapter Challenge: Casting call! We’re far enough into Volume 1 that you have a pretty good idea of what the main characters are like and have seen some interesting supporting characters. So here’s the challenge for this week! 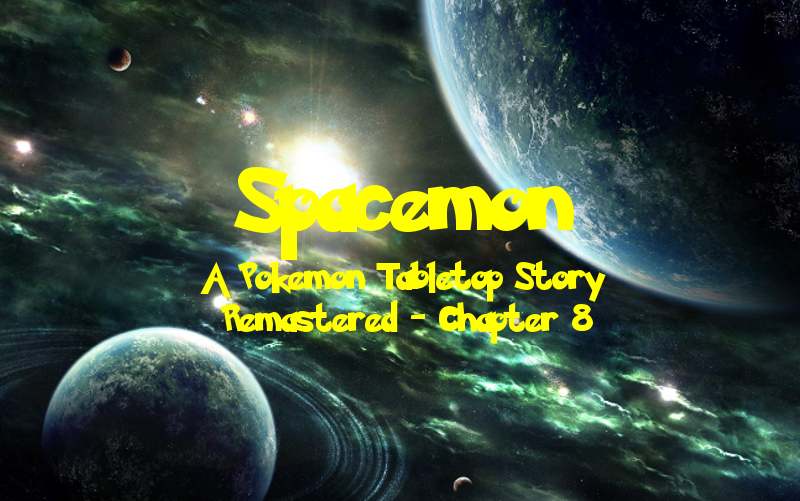 Spacemon is being adapted into a movie trilogy and it’s up to you to select the actors and actresses who will be portraying the characters! Feel free to pick anyone from A-list stars to not-very-well-known talent to your favorite voice actors! And, if you’ve read through the original Volume 1 chapters and Volume 2, feel free to cast some characters we haven’t seen yet!